WILLEMSTAD - Selikor, Curoil, and CDM Holding have signed with the Chinese Guandong Zehnrong Energy Memorandums of Understanding as a first step towards cooperation between these companies and the Chinese who are interested in acquiring the Isla Refinery. 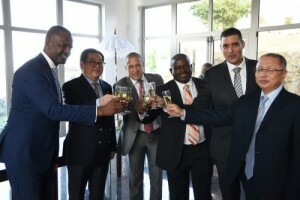 According to the Minister of Economic Development Steven Martina, Curaçao with the signing of the MoUs, Curaçao has taken an important step towards new developments. SELIKOR wants to handle the processing of industrial waste in addition to collecting garbage. In short, the company must study the feasibility of this plan, said the Director, Wesley Kook. The MoU signed with the Chinese State Company Guangdong Zhenrong relates to a feasibility study for this project.